Here I am working on a large riverbed painting. It was a commission from an old friend who lives in Texas now. I don't think they have rivers like this in Texas. I'm not sure they have water in Texas. I digress. 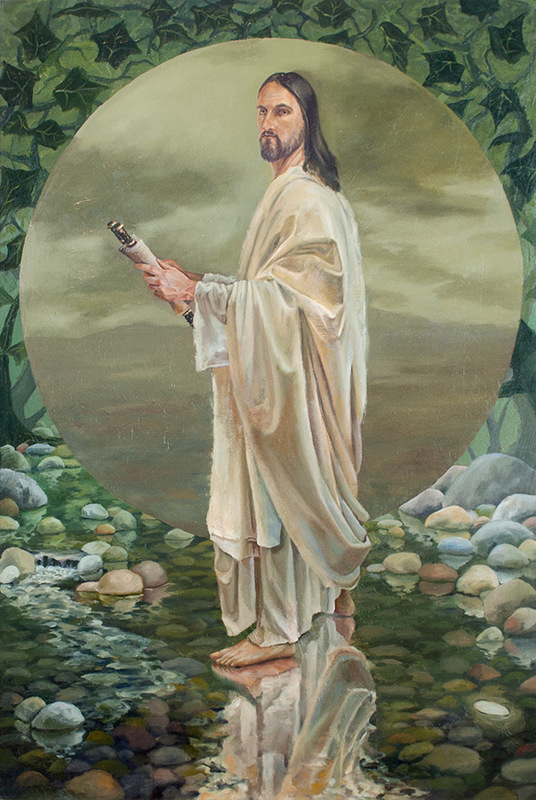 Recently I completed this religious painting, a portrait of the Lord Jesus Christ. I'm really happy with how this painting turned out. This is my son Garrett, 9 years old. Here's my latest painting - with a little help from Bailey on the finishing touches. I've been thinking about clouds lately and want to do some more cloudscapes. Maybe not quite this intense, it's definitely a stretch! These colors I think will probably knock people over. But my kids sure love them! And Bailey was helping out with this one too..